In the previous verse to the above noted scripture, it states the reason why a new wineskin is needed when pouring in new wine. Because of the fermentation process, it stretches out the skin. If the skin is old and already stretched out, it will burst and both will be lost. God has been speaking to the church at large about a new wineskin He is creating. What is the “wineskin” that he is creating? Why do we need a new one? 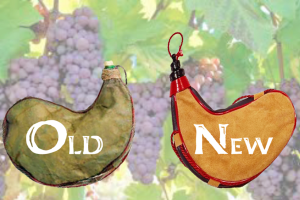 What’s wrong with the old wineskin? What I believe God is creating is a new structure through which He will move in these last days to prepare the Bride, which is the church, for her Bridegroom—to be without spot, wrinkle—to be presented to Himself at the wedding feast of the Lamb. He is “reforming” the church into the structure He created it to be. An example that we can glean from is the pile of dead, dry bones laying the valley in Ezekiel’s vision in Ezekiel 37. The pile, at that point, was the only structure each bone in that pile knew. If it was dead, dry and disconnected, then it wasn’t functioning and moving in the way it was supposed to for too long. But it was all it knew. It wasn’t until the voice of the prophet, as commanded by the Lord, called to those bones to re-form back into the skeletons they were originally, did they begin to move, connect and line up in original design God had for the structure of the body. Once the skeleton’s were reformed, then the muscle, tendons, tissue and skin could cover it, then it was finally ready to hold the breath from the Living God that He released into it. This is where we find ourselves right now as the corporate Body of Christ. God is calling the “bones” together to “re-form” back into His original design—which isn’t a pile! It is going to be different than what we are accustomed to, what we are comfortable with but if we don’t change, the whole thing will burst and there will be loss. God’s purpose in this transition of reformation is to preserve both the wine and the wineskin. The wine is a fresh Holy Spirit outpouring. The wineskin is what holds it. The current wineskin or structure is not able to hold the new outpouring that God wants to bring. It is not able to hold the Presence of God that He wants to bring and manifest in the midst of His Bride—His church—at this time in history. So we need to get ourselves ready for the change. Get ready to moved around to the place God has ordained we be in at this time and in this new structure. The thing we need to be watchful of is that holding on to the old wine and wineskin. Like it says in verse 39, once the old wine has been tasted, no one wants the new. The old is familiar, it is comfortable, it is all we know. But we need to let it go, ask the Lord for the mindset of a pioneer and not let fear lock us up and away from the awesome things God has for the church, our families, our communities, our Island, our city and our nation at this time. The new wineskin is a changed lifestyle to accommodate a new move of the Spirit in our personal lives. God wants us to change our schedules and routines in a way that shows Him that we are hungry & thirsty for Him! The new wineskin is also the means in which we worship together. You will, no doubt, see us do things a little differently as the Spirit leads us. We may not know what it is going to look like or feel like, but that’s ok because God knows. This is going to be a great time to learn how to walk according to the Spirit of God in a greater way and break away from our self-reliance and leaning on what we are used to and comfortable with. It is going to be exciting and we are all going through it together! God Bless you all abundantly!